The next stop on our Italian vacation was Tuscany. Despite what the Maestro told us about there being no vacancies in Tuscany, we were lucky enough to snag a room at the lovely Villa Armena in Buonconvento (more on that later). Buonconvento is located a half hour south of Siena and close to the famous wine regions of Montalcino and Montepulciano. After the jump, some thoughts on our wine tours, along with the misadventures of TheBetterHalf driving a rental car in Tuscany. While the vineyards may be the main attraction in Montalcino, Cateylou and I loved spending some time walking along the cobblestone streets of the town center. The views from the town are spectacular and there are numerous wine stores selling reasonably priced bottles of Brunello and Rosso di Montalcinos. We stopped and grabbed lunch at Il Grifo. Il Grifo was the most pleasant dining surprise of the entire trip and we flat out loved their homemade pinci pasta (a local speciality) and their pizzas with fresh buffalo mozzarella. The owners of Villa Armena suggested that we take a tour of the Poggio Antico vineyard located a few kilometers south of the town. Neither Cateylou nor I are big wine snobs (wine-o’s? is that a thing people say? ), but it was clear from looking around their offices that Poggio Anitco is a very highly regarded name in Italian wine. In fact their Brunello has often been included on Wine Spectator’s list of Top 100 Wines of the Year. 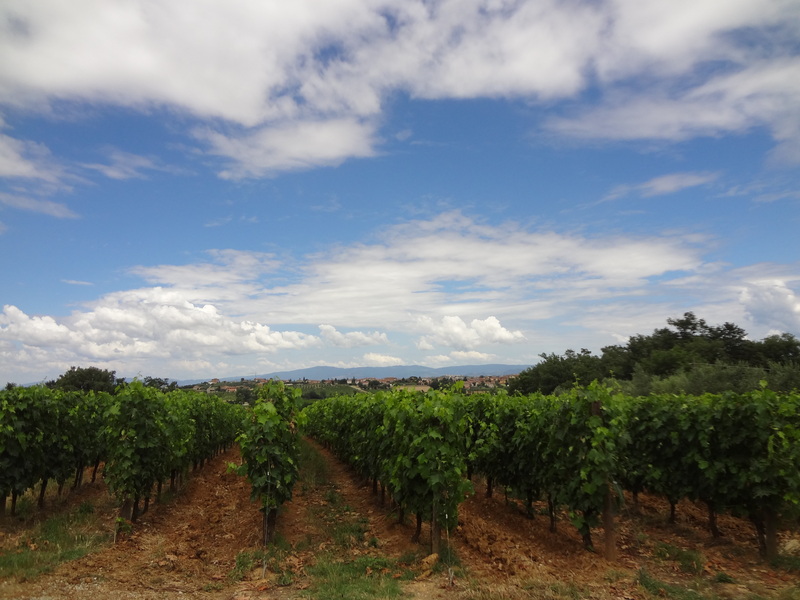 The Poggio Antico grounds were immaculate and the tour was fun and informative. I actually feel like I now know what makes a Brunello so great (it’s the Sangiovese grapes) as well the difference between Brunellos and Rosso di Montalcinos (it’s the aging process). The tour was almost too good – by the time we got to the tasting room we were ready to buy their entire harvest. The next day we headed to Montepulicano. Montepulicano was a further drive from Buonconvento than Montalcino but I can think of worse things than a 50 minute drive through the scenic Italian countryside. While in Montepulciano we visited the Poderi Boscarelli winery. Boscarelli is a small, family run operation that specializes in producing Vino Nobile di Montepulciano. Vino Nobile di Montepulciano is the proprietary wine for the Montepulciano region and is comprised of mostly Sangiovese grapes. The Boscarelli tour was relatively informal and focused on the property’s beautiful grounds. But the real highlight was the extensive tasting session. Our tour guide, Francesca, gave our small tour group ample pours of all seven Boscarelli wines and did a thorough job of explaining what made each one distinct. We also had the chance to try (and subsequently buy) some of their fantastic olive oil that comes directly from their olive trees. As promised, a few words on the process of renting a car in Italy. Well that’s not quite fair. In many cases renting a car is essential. In fact, CateyLou and I are very happy that we decided to rent a car for our tour of Tuscany (which is admittedly easier to say after we returned our car in one piece). Let’s start at the beginning. We rented our car though AutoEurope UK, a third party broker for rental cars in Europe. Although there is an AutoEurope US website, the deals on the Auto Europe UK site are much better, even taking into account the currency difference. Booking through the UK site probably saved us 60-70% on our rental over the US website- a pretty significant difference. The car we rented was a Fiat Punto. For those of you unfamiliar with a Punto, it’s like a mix between a Little Tykes toy car and the Flintstones mobile. In other words, it’s not great. But it was an automatic (kind of), which is rare in Europe. Most car rental agencies in Italy only have a few automatics in their fleet so it’s essential to book a few months in advance. Also of note, we chose to pick up our rental car from the Florence airport (rather than the center of Florence) to avoid any city driving and the possibility of ZTL fines. The driving itself was mostly fine. Yes, Italian drivers are aggressive. 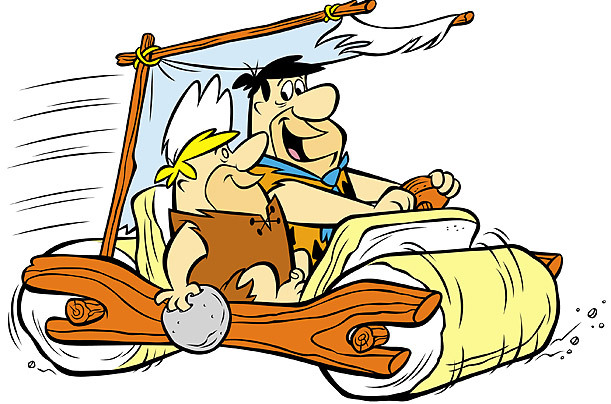 And sure, our car didn’t have the horsepower to make it up some of the steeper hills we encountered. But it was great to be able to enjoy the countryside at our own pace. 2 of my absolute favorite wine regions! Love this post; makes me nostalgic. Those pictures are beautiful, the scenery.. oh my goodness, perfect! We love both those wonderful little towns…good food, good wine, and so pretty. We travel to Europe every year and always rent a car. I guess it just depends on the company you use as we have never had a problem getting an automatic car with GPS included when we have been in Italy. Thanks for the comment Karen. We booked a few months in advance so we didn’t have an issue reserving an automatic in Florence. That said, a few of the car rental agencies I contacted said that the automatics tend to sell out quickly in the summer months and that they are only available in the bigger cities. For instance, there doesn’t appear to be any automatics available to rent in Siena. I guess the moral of the story is I blame my dad for not teaching me how to drive a stick (sorry Dad).